Cut the fish as you desire. Mix the batter ingredients in a bowl until there is no more lumps. Dip the fish into the batter then fry in a hot oil pan over medium heat. Cut the cheese by 1/2 inch thick and make the shape of the cheese as you desire. 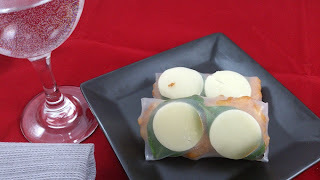 The picture shows a circular shape cheese. Soak the rice wrapper in warm drinking water and place two slices of cheese side by side. 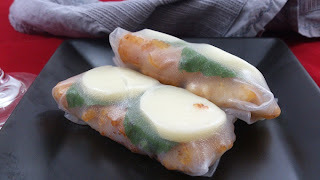 Place the basil leaves on top of the cheese and the fried fish then gently wrap.